A few of our invited guests for Thursday’s Thunderbird Media Preview have mentioned calling in to work this week, sick with the Thunderbird Flu. My version of this mysterious illness? Sleeplessness (note the time of this post) and an inability to type the word Thursday at the first try. Somehow, it always comes out spelled Thunderbird the first time. And so, as we close in on opening our season on Saturday, senses are heightened and grins are uncontrollable. We finally did it. A big steel coaster. 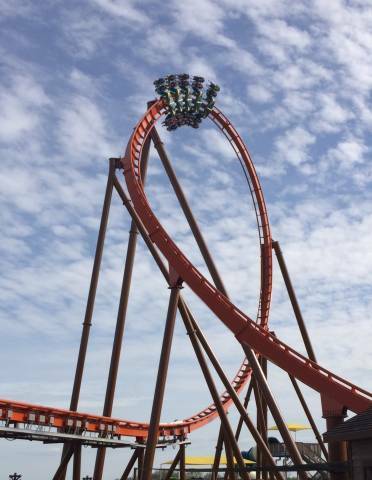 A B&M coaster, at that. Thanks to all for the endless cheers of encouragement this past year. We’re just days away now and can hardly contain our excitement. And we think it’s contagious. I’m so glad that I’m not the only one who can’t sleep in excitement for Thursday!!! I’ve had drea,s about Thunderbird and Holiday World almost every night for the past few days! Prescribed medicine: Better get the park of Fun and Soon ……… Holiday World !!!!!!!!! You’ll just to have to wing it ! Absolutely excited about Friday and Saturday with Thunderbird, but someone needs to take a trip up to HAARP and change the weather forecast for this weekend! Can’t wait to take a ride! I can’t wait to get back to Holiday World, finally a steel roller coaster! I rode this coaster ans it was AWESOME. I did have a problem getting into the seat as I am 4’11 and 48 yrs old. it was a terrible struggle and a little embarassing trying to jump up into the seat. I will say that me and the kids had a good laugh on the way home. I am wondering if I am the only adult that has had this problem.